Our organization is one of the leading company in the market for the manufacturing and supplying Skirts, which we made from fine quality Indian cotton . Available in various sizes, these cotton skirts have already accredited a huge demand list in our accounts. 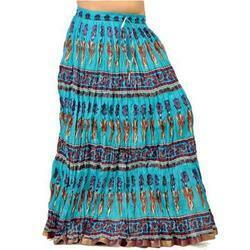 We offer these skirts at most affordable prices to our precious customers. Keep ahead in the Traditional fashion race by wearing this Lehanga choli set that comes with a dupatta. It is made of pure cotton and has been dyed in double shade. The very vibrant Orange color base is combined with beautiful Navy Blue color. The look has been further enhanced with sparkling sequins and mirror work. The border of the dupatta has been decorated with little beads continuation suspended in loops. The Tie and Dye work all over is the speciality of Jaipur. This beautiful attire has been crafted by the traditional craftsman of Rajasthan. Look gorgeous and feel comfortable with this ethnic Rajasthani Lehanga choli set that comes with a dupatta. It is made of pure cotton and has been dyed in double shade. The very elegant turquoise color base is combined with beautiful navy blue color. The look has been further enhanced with sparkling sequins and mirror work. The border of the dupatta has been decorated with little beads continuation suspended in loops. The Tie and Dye work all over has been the speciality of Jaipur. This traditional attire has been crafted by the traditional craftsman of Rajasthan. Give the complete look to your festive gatherings with this traditional design Lehanga choli set that comes with a dupatta. 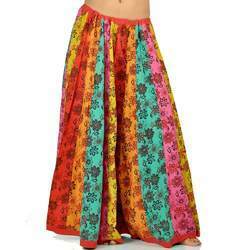 It is made of pure cotton and has been dyed in double shade with bandhej print. The very vibrant red color base is combined with beautiful black color. The look has been further enhanced with sparkling sequins and mirror work. The border of the dupatta has been decorated with little beads continuation suspended in loops. The Tie and Dye work all over is the speciality of Jaipur. The traditional attire has been crafted by the traditional craftsman of Rajasthan. This ethnic Rajasthani Lehanga choli set comes along with a dupatta. It is made of pure cotton and has been dyed in double shade. The very vibrant orange color base is combined with beautiful Brick Red color. The look has been further enhanced with sparkling sequins and mirror work. The border of the dupatta has been decorated with little beads continuation suspended in loops. The Tie and Dye work all over has been the speciality of Jaipur. The traditional attire has been crafted by the traditional craftsman of Rajasthan. Include yourself in the glamour of the season with this Orange-Olive Green Lehanga Choli with Dupatta. It is made of pure cotton and has been dyed in double shade. The very vibrant Orange color base is combined with beautiful Olive green color. The look has been further enhanced with sparkling sequins and mirror work. The border of the dupatta has been decorated with little beads continuation suspended in loops. The Tie and Dye work all over is the speciality of Jaipur. This traditional attire has been crafted by the traditional craftsman of Rajasthan. 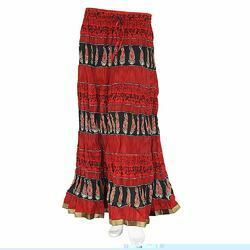 This alluring wrap around skirt in red base is an exclusive masterpiece from Rajasthan. The advantage of this amazing skirt is its wrap around pattern for convenient fitting on any waist size. The skirt is printed all over with Rajasthani hand block print in yellow colour. This pretty skirt is a perfect drape for casual and formal outings. Box The Sartorial Elegance & Style Of The Season On Wearing Red Coloured Kurti By Little India. Look Classy And Stylish In This Piece And Revel In The Comfort Of The Soft Cotton Fabric. This Attractive Kurti Will Surely Fetch You Compliments For Your Rich Sense Of Style. Leave a sensational impact on everyone with this amazing Lehanga choli set that comes with a dupatta. It is made of pure cotton and has been dyed in double shade with bandhej print. The very vibrant Yellow color base is combined with beautiful Green color. The look has been further enhanced by decorating it with sparkling stars and mirror work. The border of the dupatta has been decorated with little beads continuation suspended in loops. The Tie and Dye work all over is the speciality of Jaipur. This Ethnic attire has been crafted by the traditional craftsman of Rajasthan. This Rajasthani Lehenga choli set comes with a dupatta. It is made of pure cotton and has been dyed in double shade. The very vibrant yellow color base is combined with beautiful red color. The look has been further enhanced with sparkling sequins and mirror work. The border of the dupatta has been decorated with little beads continuation suspended in loops. The Tie and Dye work all over is the speciality of Jaipur. The traditional attire has been crafted by the traditional craftsman of Rajasthan. This beautiful and traditional colourful lehanga pattern skirt is a specialty of Jaipur. The amazing lehanga is designed in vertical broad colourful stripes carrying floral print in luscious colours. This alluring masterpiece has a beautiful flare which showcases the Rajasthani tradition. The waist belt has cotton strap inside to tie knot on any waist size. This pretty lehanga is worn by traditional women in Rajasthan for mesmerising appearance. Box The Sartorial Elegance & Style Of The Season On Wearing Pink Coloured Printed Kurti By Little India. Look Classy And Stylish In This Piece And Revel In The Comfort Of The Soft Cotton Fabric. This Attractive Kurti Will Surely Fetch You Compliments For Your Rich Sense Of Style. The sartorial elegance & style of the season on wearing red colored striped kurti by Little India. Look classy and stylish in this piece and revel in the comfort of the soft cotton fabric. This attractive kurti will surely fetch you compliments for your rich sense of style.. Round Neck Printed Cotton Kurti the sartorial elegance & style of the season on wearing black colored Printed kurti by little India. Look classy and stylish in this piece and revel in the comfort of the soft cotton fabric. This attractive kurti will surely fetch you compliments for your rich sense of style. Leave Everyone Mesmerized With The Appealingly Chic And Very Fashionable Designer Sanganeri Top. 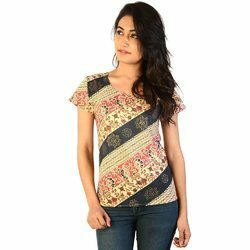 This Top Is Beautified With Block Print All Over. The Neckline And Sleeves Are Highlighted With Beautiful Rajasthani Laces. Box The Sartorial Elegance & Style Of The Season On Wearing Black Coloured Printed Kurti By Little India. Look Classy And Stylish In This Piece And Revel In The Comfort Of The Soft Cotton Fabric. This Attractive Kurti Will Surely Fetch You Compliments For Your Rich Sense Of Style. 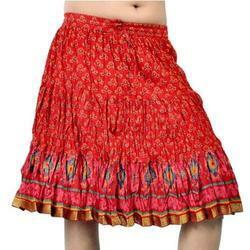 This cute mini skirt with red base is beautified with abstract hand block Sanganeri print in luscious colors. This appealing skirt is refined with golden and blue zari lace for finishing appearance. It has a soft elastic belt for convenient fitting on the waist. It is specially packed in traditional Sanganeri crushed style so you need not to iron it before wearing. This beautiful popsicle red knee length skirt will add charm to your personality. 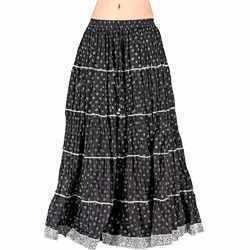 This beautiful skirt is adorned with silver block print all over. This red skirt has nice flare that is ending up with silver zari lace and glittering sequin work. The stunning traditional skirt is adorned with thin silver laces. It has a soft elastic belt for convenient fitting on the waist. 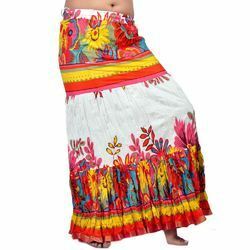 This skirt is made of pure cotton with cotton voile lining for more comfort. It is specially packed in traditional Sanganeri crushed style so you need not iron it before wearing. This stylish skirt looks great when paired with your favorite Tops, Shirts, Kurtis and T-Shirts. It is easy to sport on any occasion and comfortable for any season. This very beautiful knee lenght skirt in black base is beautified with floral hand block Sanganeri print in luscious red color. It is suitable for young ladies. This appealing skirt is refined with golden and red zari lace for finishing appearance. It has a soft elastic belt for convenient fitting on the waist. It is specially packed in traditional Sanganeri crushed style so you need not to iron it before wearing. Get noticed in the party with this pure cotton sea – green base knee length skirt. 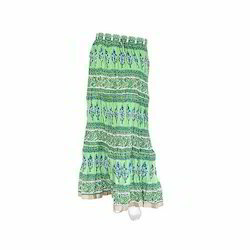 This skirt is embellished with abstract design hand block print in white color over sea green base and adorned with exquisite golden lace. The fashionable skirt has an admiring flare that gives it a stylish appearance. It has a soft elastic belt for convenient fitting on the waist. It is specially packed in traditional Sanganeri crushed style so you need not to iron it before wearing. 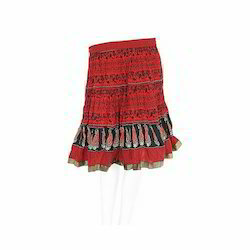 This Red-black colour sanganeri printed cotton skirt is a best wear in any social gathering. The short skirt is adorned with intricate Rajasthani bootie design all over. The broad black red border at bottom and zari lace is exhibiting ones taste of styling. It has a soft elastic belt for convenient fitting on the waist. This skirt is made of pure cotton for more comfort. It is specially packed in traditional Sanganeri print. This stylish skirt looks great when paired with your favorite Tops, Shirts, Kurtis and T-Shirts. It is easy to sport on any occasion and comfortable for any season. The Parrot Green colour shade on this pretty long skirt is giving it a royal look. The appreciable floral design work all over is separated by thin stripes. This designer materpiece is a result of the creative workmanship of Rajasthan. The zari border at the bottom is designed with intricate sequin work. It has a soft elastic belt for convenient fitting on the waist. This skirt is made of pure cotton for more comfort. It is specially packed in traditional Sanganeri print. The dress is ideal as a gift.... Be it the Valentine Day, her Birthday, your Marriage Anniversary or any special occasion. You will be always remembered for it. 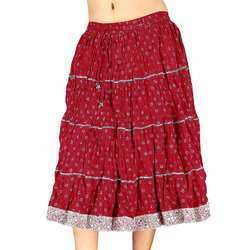 This Red-black colour sanganeri printed cotton skirt is a best wear in any social gathering. The long skirt is adorned with intricate Rajasthani bootie design all over. The broad black red border at bottom and zari lace is exhibiting ones taste of styling. It has a soft elastic belt for convenient fitting on the waist. This skirt is made of pure cotton for more comfort. It is specially packed in traditional Sanganeri print. This stylish skirt looks great when paired with your favorite Tops, Shirts, Kurtis and T-Shirts. It is easy to sport on any occasion and comfortable for any season. This chic high on fashion torquiose long skirt is an ideal wear for young ladies. The alluring skirt is adorned with intricate Sanganeri floral motif in horizontal strips patterns which can adds charm to a look. The flare is graced with zari lace at the bottom. It has a soft elastic belt for convenient fitting on the waist. It is specially packed in traditional Sanganeri crushed style so you need not to iron it before wearing. 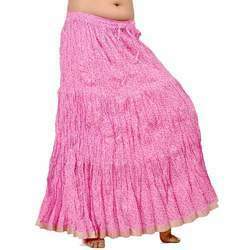 This fashionable pink Rajasthani print cotton long skirt is designed for a chic and beautiful look. The pretty skirt is adorned with pink dots like design over light pink base. The flare is graced with zari lace at the bottom that gives it an ethnic appeal. It has a soft elastic belt for convenient fitting on the waist. It is specially packed in traditional Sanganeri crushed style so you need not to iron it before wearing. This unique and stunning white long skirt is a suitable attire for classy and fashion conscious ladies. This skirt is featured with muliti colour floral design all over. The flare is graced with shimmering golden zari lace to give a designer look. It has a soft elastic belt for convenient fitting on the waist. It is specially packed in traditional Sanganeri crushed style so you need not to iron it before wearing. This ingenious long skirt in black base is completely a classic masterpiece for casual and party occasions. This black skirt is modified with floral silver booties all over to give it an ethnic look. The central part is elevated with silver laces and the flare is decorated with zari lace for complete enhancement. 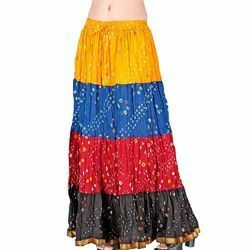 This skirt is packed in traditional Sanganeri crushed style. You need not iron it before wearing. It has a soft elastic belt for convenient fitting on the waist. This skirt is made of pure cotton with cotton voile lining for more comfort. The dress is ideal as a gift.... Be it the Valentine Day, her Birthday, your Marriage Anniversary or any special occasion. You will be always remembered for it. 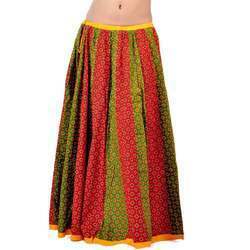 This beautiful and traditional colourful lehanga pattern skirt is a specialty of Jaipur. The amazing lehanga is designed in vertical broad red and black stripes of different cloths stitched together. It is printed all over with Rajasthani hand block print in luscious colours. This alluring masterpiece has a beautiful flare which showcases the Rajasthani tradition. The waist belt has cotton strap inside to tie knot on any waist size. This pretty lehanga is worn by traditional women in Rajasthan for mesmerising appearance. 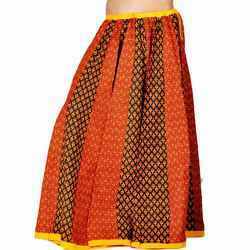 This beautiful and traditional colourful lehanga pattern skirt is a specialty of Jaipur. The amazing lehanga is designed in vertical broad red and green stripes of different cloths stitched together. It is printed all over with Rajasthani hand block print in luscious colours. This alluring masterpiece has a beautiful flare which showcases the Rajasthani tradition. The waist belt has cotton strap inside to tie knot on any waist size. This pretty lehanga is worn by traditional women in Rajasthan for mesmerising appearance. 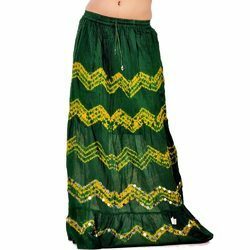 This beautiful and traditional lehanga concept skirt is a specialty of Rajasthan. 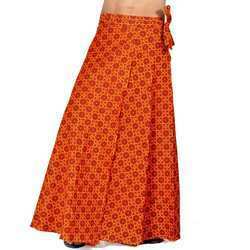 The amazing skirt is designed with white and orange tie n dye hand work on dark maroon shade. The alluring flare is decorated with mirror work all over showcasing Rajasthani tradition. The waist belt has cotton strap inside to tie knot on any waist size. The dress is ideal as a gift.... Be it the Valentine Day, her Birthday, your Marriage Anniversary or any special occasion. You will be always remembered for it. This traditional Tie and Dye lehanga concept skirt is a specialty of Rajasthan. It is hand crafted in dual shades. 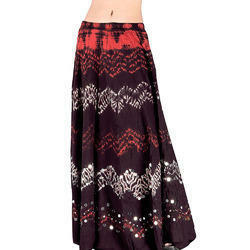 This alluring skirt is decorated with mirror work all over and enriched with beautiful flare. The waist belt has cotton strap inside to tie knot on any waist size. 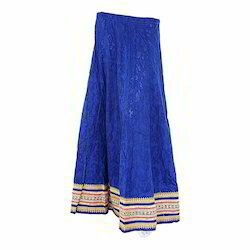 This fashionable long colourful skirt is a unique materpiece designed by the artisans of Rajasthan. The beauty of this skirt is bandhej on multi colour base in luscious shades. This pretty skirt has nice golden zari lace at the hem to make it more charismatic. It has a soft elastic belt for convenient fitting on the waist. This skirt is made of pure cotton with cotton voile lining for more comfort. It is specially packed in traditional Sanganeri crushed style so you need not iron it before wearing. The dress is ideal as a gift.... Be it the Valentine Day, her Birthday, your Marriage Anniversary or any special occasion. You will be always remembered for it. This beautiful and traditional Blue colour Lehenga is a specialty of Rajasthan prepared by women in villages. The amazing skirt is designed in horizontal broad colourful stripes. These stripes are adorned with bandhej print in luscious colours. 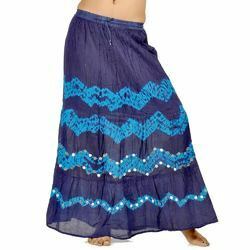 This alluring skirt has a beautiful flare showcasting Rajasthani tradition. The skirt is made of pure cotton for more comfort. The dress is ideal as a gift.... Be it the Valentine Day, her Birthday, your Marriage Anniversary or any special occasion. You will be always remembered for it. 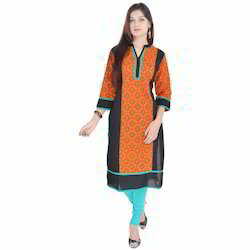 Box the sartorial elegance & style of the season on wearing Orange coloured Printed kurti by Little India. Look classy and stylish in this piece and revel in the comfort of the soft cotton fabric. This attractive kurti will surely fetch you compliments for your rich sense of style. Box The Sartorial Elegance & Style Of The Season On Wearing Black N White Coloured Printed Kurti By Little India. Look Classy And Stylish In This Piece And Revel In The Comfort Of The Soft Cotton Fabric. This Attractive Kurti Will Surely Fetch You Compliments For Your Rich Sense Of Style. The sartorial elegance & style of the season on wearing Pink colored kurti by Little India. Look classy and stylish in this piece and revel in the comfort of the soft cotton fabric. This attractive kurti will surely fetch you compliments for your rich sense of style. Box The Sartorial Elegance & Style Of The Season On Wearing Blue Coloured Printed Kurti By Little India. Look Classy And Stylish In This Piece And Revel In The Comfort Of The Soft Cotton Fabric. This Attractive Kurti Will Surely Fetch You Compliments For Your Rich Sense Of Style. Box the sartorial elegance & style of the season on wearing Royal Blue coloured kurti by Little India. Look classy and stylish in this piece and revel in the comfort of the soft cotton fabric. This attractive kurti will surely fetch you compliments for your rich sense of style. This aesthetically designed outfit has ethnic Sanganeri print in vibrant colours. The beautiful top is printed all over in striped pattern over off-white base. Owing to its exquisite workmanship, this traditional Kurti has become highly popular among fashion conscious females.